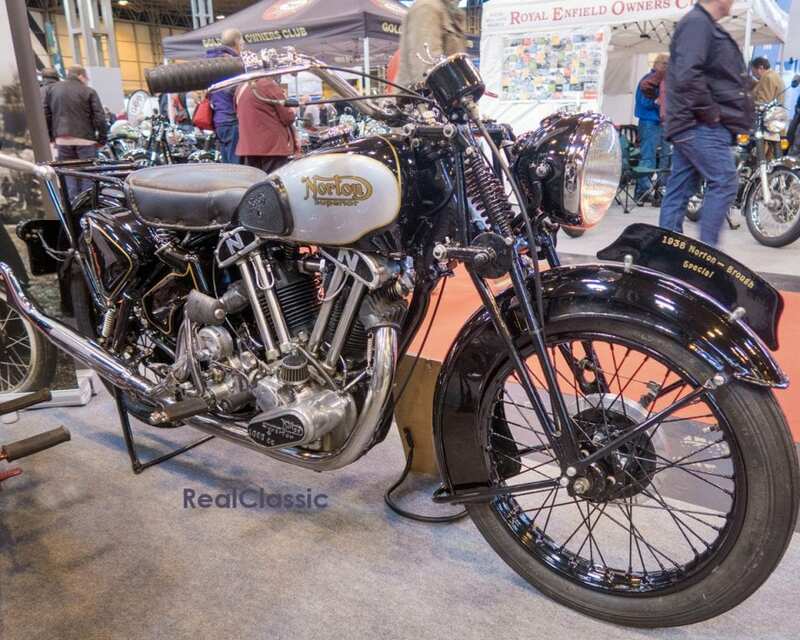 Here’s something you don’t see every day – a 1938 Norton Superior which was built by Bill Higginson and his friend, Maurice Cross. Apparently all you have to do is take a Norton 16H frame, fabricate a replica engine based on a Morgan / Matchless Model X bottom half and Brough Superior SS100 top half, mate a Norton Commando clutch and a dolls-head gearbox, combine an Amal Concentric carburettor with an Amal Type 29 twin float with a home-made float bowl, modify the frame and insert all of the above before attaching your own fabricated exhausts. Oh – and there’s an Alton belt-driven generator tucked between the engine and gearbox whilst sparks use a home-made optic trigger system. The effort that has gone into this special is tremendous and I am in awe of anyone who has the patience and ability to produce this type of engineering marvel. 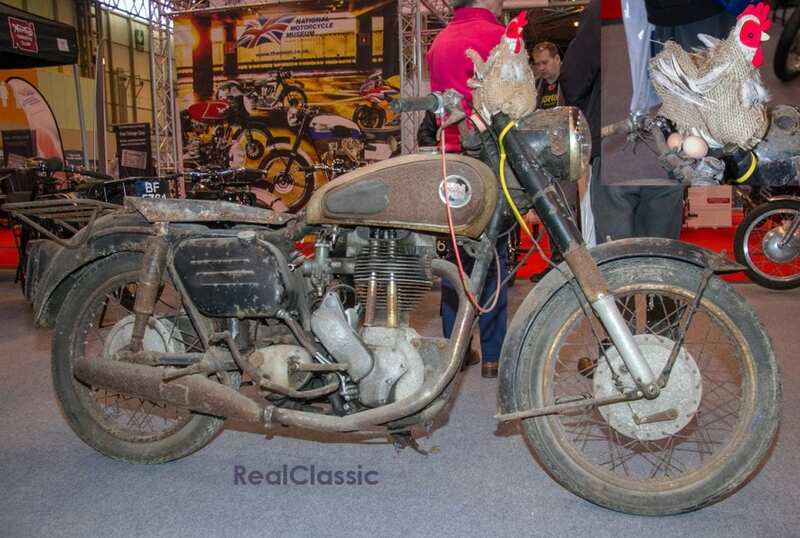 I then spotted something rather different on the Royal Enfield Owners Club stand and have included it as I hadn’t come across one before. This is the Flying Flea which was used extensively by the British Army Red Berets parachute regiment for airborne drops after it was released for use in 1942. The nickname came from its light weight of about 130lb and its diminutive size; 26 inches wide and 75 inches long. 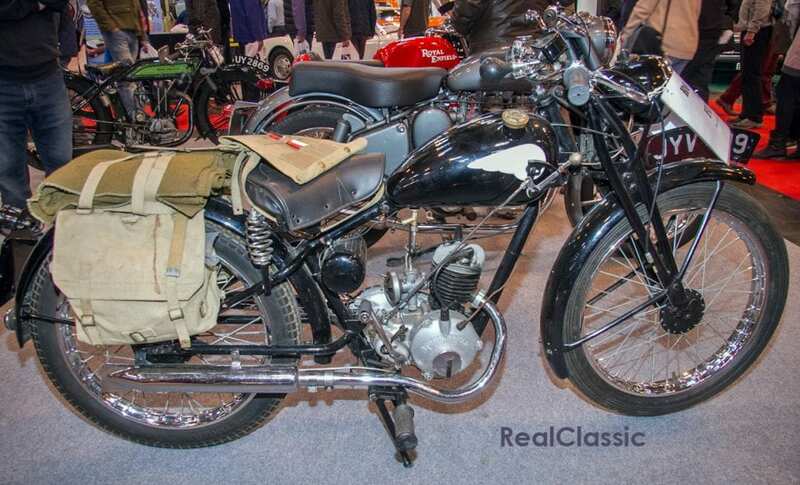 The Flying Flea’s use in WW2 is paradoxical as it’s a faithful replica of the DKW RT100, a 98cc two-stroke which Ted Pardoe, Royal Enfield’s chief designer, produced at the request of the Dutch concessionaire. Apparently the German authorities ended DKW’s supply agreement after the concessionaire, RS Stokvis en Zonen, refused to force out its Jewish owners. The only change Pardoe made was to increase engine capacity to 125cc. After the war it was offered to the public as the RE125 but was replaced in 1953 by the Ensign. 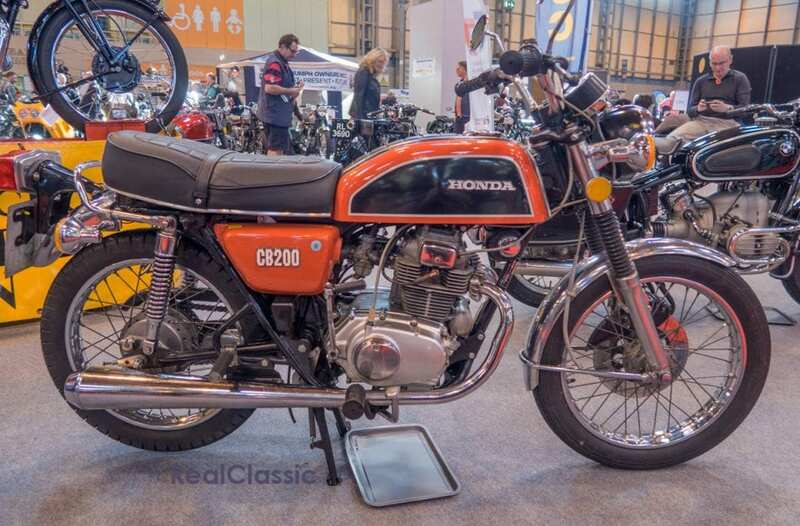 I’ve always had a soft spot for the Honda CB200 ever since Eddy let me ride his around the pub car park in 1976; it was so much more of a motorcycle than my Suzuki B120P. This one dates from 1977 and is exactly the same colour as Eddy’s. 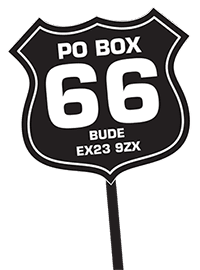 it’s charming but I’m not sure I would want one now, although nostalgia is such a powerful reason to spend money on a motorcycle. The same can’t be said for the B120P, however. 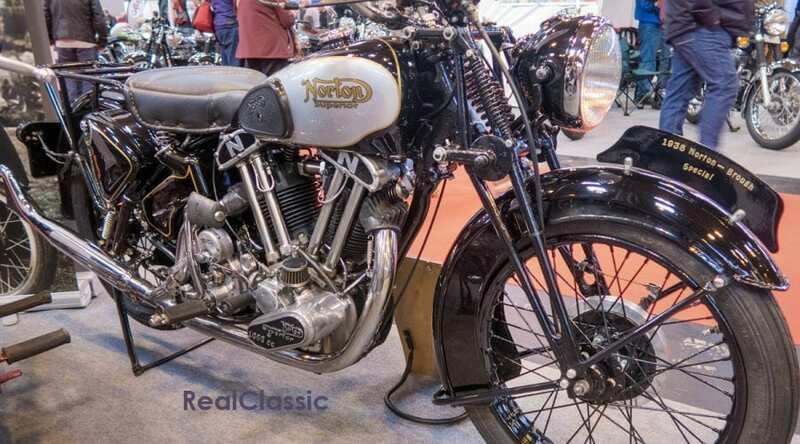 Let’s finish the Classic Motor Show with this bike from the Norton stand – well it’s evident it must have been a barn find and it does look a bit fowl! No sooner had I returned from the Classic Motor Show than it was time to return to the NEC to spend four days on Robin Hughes’ VFRNZ stand. Although it’s rather tiring being ‘behind the counter’, you do get to meet some interesting people and take photos before the crowds arrive. There was lots to see, lots to buy and all the main manufacturers were there although, as in previous years, there were some machines to interest the classic enthusiast. Paradoxically the oldest machine I came across had four wheels rather than two. 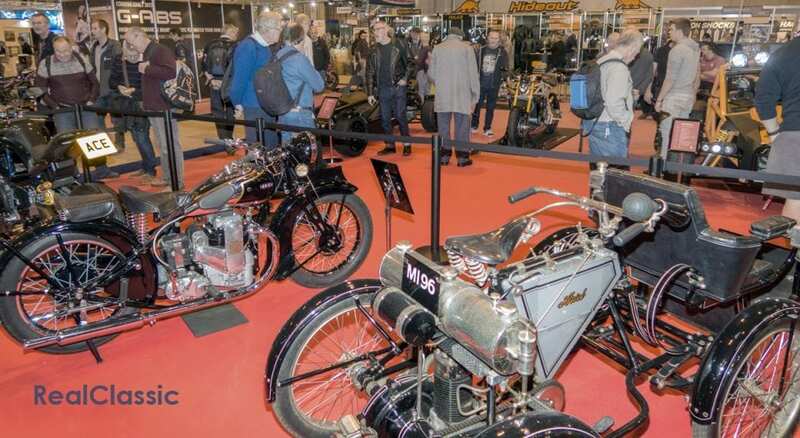 It was a Royal Enfield Quad from 1898 which formed part of the National Motorcycle Museum display. 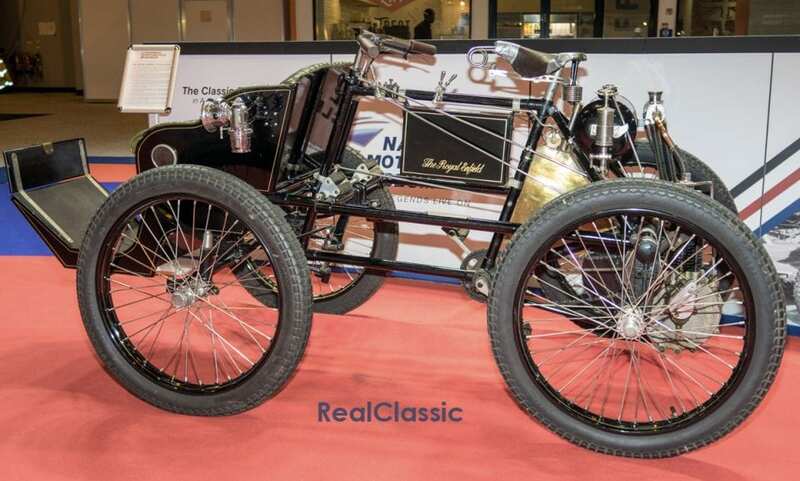 Designed in 1897 by RW Smith, joint founder of Royal Enfield with Albert Eadie, it was built for his own use. Quadricycles and tricycles were favoured as bicycle frames of the time couldn’t bear the weight of an engine as well as a rider and, possibly, a passenger too. Power came from a De Dion 2¾hp air-cooled single cylinder engine with an automatic inlet valve and side exhaust valve, the drive being transferred via a small pinion on the engine crankshaft meshing with a large gear wheel on the back axle. Early models, such as the one here, had no clutch or any means to disconnect the drive but by 1900 Smith had designed an improved drive with two gears and a neutral. In fact in the same year a production model completed a 1000 mile road trial organised by the Automobile Club; they made them tough in those days. I had to include this machine, also on the NMM stand, for reasons of political suitability – it’s a Trump-JAP from 1912. Although the marque was apparently sponsored in the 1920s by the Duke of York, it apparently had no political pretensions. Trump Motors was founded in about 1906 by Francis M McNab, and was located first in Liphook, Hants, then at the Foxdale Works at Byfleet (next to Brooklands), and finally Lombard Street, Birmingham. McNab had much success at Brooklands and as early as May 1909 he won the 500cc one-hour race with a new record over 48 miles. As with the example here, Trump used JAP engines for the most part, starting with 3½hp single and a 6hp V-twin in 1910, additional 3¼hp single and 8hp V-twin models in 1913 but back to a 4hp single and 6hp V-twin the following year. After the Great War, McNab was in charge of design and track work but Colonel RN Stewart took overall control. 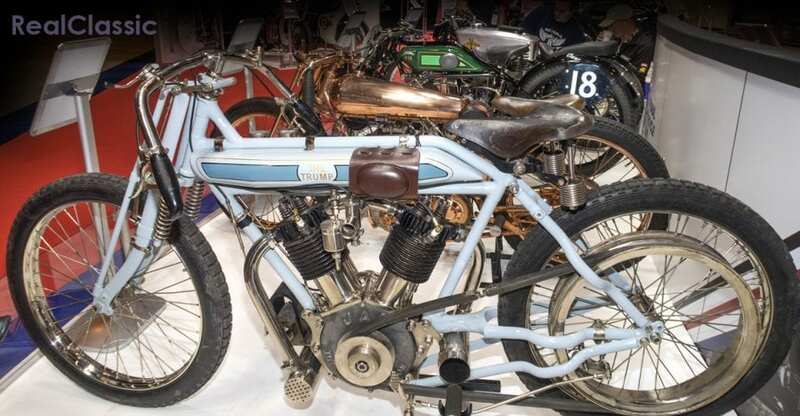 Stewart was very much into record-breaking activity and in 1922 his chain-driven Trump Anzani took the two-hour record for Class E (1000cc machines) at Brooklands at a speed of 78.85mph. Various machines of various capacities were added to the range but McNab retired with ill health in 1923 and Trump disappeared soon after. This Trump features an experimental 976cc JAP engine, comprising the top end from their V8 aero engine mated with a twin cam, side-valve bottom end. Before we leave the NMM display let’s briefly look at this BSA MC-1 prototype racer developed by two of the greats from the British motorcycle industry – Bert Hopwood and Doug Hele. 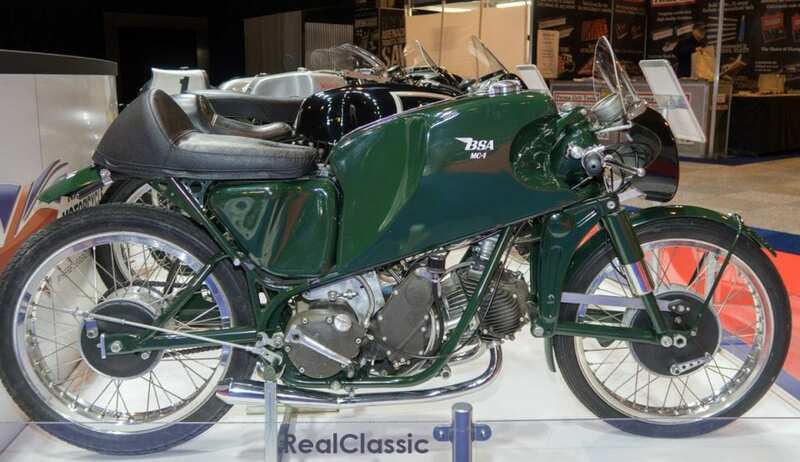 Penned by Hopwood in 1950, the 248cc single, with four radial valves and two bevel driven overhead cams, was fed by twin Amal carbs, had a 10:1 compression ratio and was good for 110mph. The front fork was leading link and the back end featured monoshock suspension, some 30 years before its widespread use in racing. Hopwood knew BSA would want 100% race success if it was to progress his proposal of the development of an advanced sports roadster based on the MC-1 so, despite support from no lesser person than Geoff Duke, he, presumably very reluctantly, decided to abandon the project as he didn’t believe the MC-1 would compete successfully at the TT without significant further investment.